1202 is a multi-purpose, pluggable, cloud-based system for managing, publishing and sharing any kind and any amount of content. Everything is online and backed-up, no need to install or update software or worry about resources. 1202 is lean and tuned to deliver a snappy experience and blisteringly fast performance. Uses encrypted connections - rated A+ by Qualys SSL Labs - and offers password strength checking and IP-restricted access. Import any amount of data via upload or copy/paste and 1202 will 'automagically' match and link. Create your own guides to help users perform tasks. Grant access to as many users as you like, tailor their accounts to fit their roles and needs. 1202 supports multiple languages. This currently includes English and Dutch. More languages will follow soon. Basically, 1202 lets you work with a database in an easy and efficient way. Because databases can store anything from simple notes to website content and research data, you can go a lot of different ways. Perhaps just as important: 1202 offers practically unlimited ways to retrieve the data you put into it, for instance to show it online or create spreadsheet or PDF documents. We encourage you to explore any other uses 1202 might have. It is a very open and flexible system, which makes it easy to put any type (or different types) of content together. Also, you can alter the system while it is running, making it possible to grow and scale at the same pace as business. 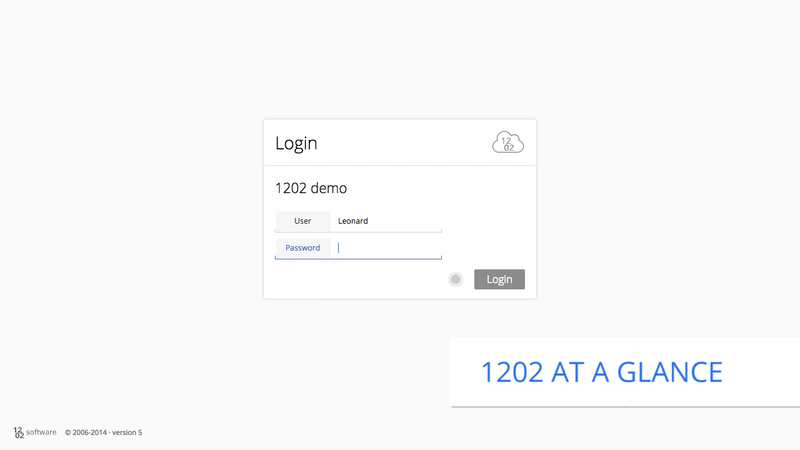 You can use 1202 as a plug-in, to dynamically enrich templates or complement other systems, either as a permanent or temporary solution. We don't conceal or encrypt your data (except from passwords, obviously). You can retrieve every scrap of it. Also, since you pay per month, you won't have to sit out some long contract. This includes 2 GB SSD storage. If you use more, every additional GB is $1/month. For EU customers we maintain prices in euros: €10.89/month, every extra GB €0.97/month (including 21% VAT). Trial accounts include 100 MB. You can terminate your subscription anytime. Resource usage is based on 'fair use'. Payments (credit card) are handled safely and securely by Stripe. We do not see or store your credit card data. I want to start my free, full-feature, no-obligation, 1-month trial right now. I accept the general terms and conditions that apply. System name: characters a-z and 0-9 only, length between 5 and 20 characters, needs to be unique. Your name: length between 5 and 100 characters. Check your email for your credentials. No email? Create a ticket in My 1202. Still not working? Create a ticket in My 1202. 1202 software has been providing services for the web since 2007. We develop and make our own system, 1202, and create tailor-made solutions with it. The development of 1202 was fueled by the need for a system that was versatile and easy to implement as well as use. It was originally intended as a content management system, like WordPress or Joomla, but the scope broadened considerably due to client demands. This made 1202 into a system that is arguably one of the most versatile systems on the web, while still maintaining a high degree of usability. We believe it to be the perfect foundation for any project on the web and encourage anyone to explore its uses. Of course, we can help to implement 1202 within your project, or design a project based on 1202. We can make you an attractive offer and will use our creativity and expertise to help you achieve success.